The White House is warning that catastrophe will strike if Congress fails to raise the limit on the national debt: With too little cash to pay creditors, the U.S. government would default. Interest rates would skyrocket. And the economic recovery would collapse. But behind the scenes, Treasury Secretary Timothy F. Geithner has already begun juggling the books to conserve cash, draining a special account at the Federal Reserve. And with the debt forecast to hit the legal limit of $14.3 trillion in just a few weeks, he has a range of tools at his disposal, including borrowing money from a pension fund for federal workers. Geithner also has authority to pay investors first for interest they're owed on the debt, according to a decades-old legal opinion. A growing number of conservatives argue that by making interest payments first, the government could avoid default and the Obama administration's predictions of economic Armageddon. But the nation could pay a substantial price in the form of higher interest rates if it relied for long on such evasive maneuvers, the Government Accountability Office said in a recent study. And financial analysts say market confidence could be shattered if Geithner had to cut off pay to combat troops or stop writing Social Security checks -- even if he never missed an interest payment. "I think the failure to meet any commitment would be viewed by the markets as default and would be deeply unnerving," said Robert Rubin, who, as Treasury secretary in the mid-1990s, prevented the debt from breaching the limit during the longest battle over the issue on record. "We don't know" what would happen in the event of default, Rubin said. "But I think it is totally irresponsible to take the risk of trying to find out." deficit-reduction trigger, which would automatically cut outlays and raise taxes if certain budget goals aren't met. The debt is forecast to hit the limit in mid-May. 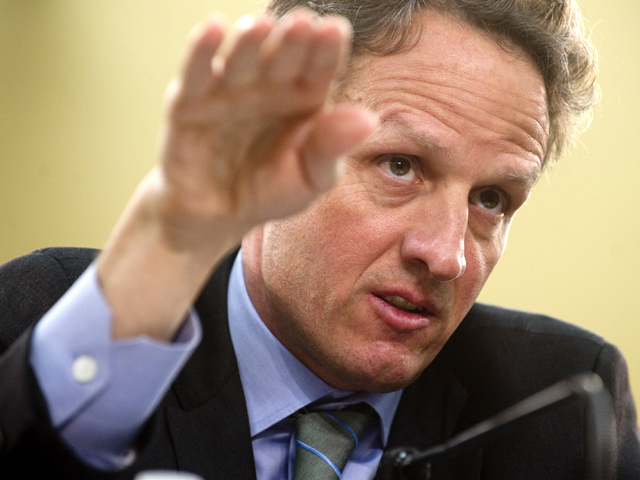 Geithner has said he can keep the wolf from the door until early July. So far, the Treasury has nearly drained a $200 billion cash-management account at the Fed, providing a cushion of money to pay bills without new borrowing. Next, Geithner is likely to take a series of "extraordinary actions," such as suspending the issuance of special securities that help state and local governments manage their own finances. Once the debt hits the limit, Geithner may declare a "debt issuance suspension period," permitting him to borrow from the pension fund for federal workers. Rubin pioneered these strategies in 1995, at the start of the budget battles between President Bill Clinton and Republicans led by House Speaker Newt Gingrich (R-Ga.). As the fight dragged on through two government shutdowns, Rubin had to juggle the nation's bills for 135 days. Finally, Clinton threatened to delay Social Security checks, spurring Congress to approve more borrowing to make sure the checks went out on time. Then, as now, a new GOP House majority was pressing a Democratic president to shrink the government. Congress grudgingly raised the debt limit six times between 1995 and the loss of GOP control in 2007, while the Treasury repeatedly resorted to extraordinary measures. Geithner can use the same tactics, Rubin said, but "the trouble is the numbers are much bigger this time." In November 1995, the debt stood just under $5 trillion, and the government was spending less than half what it does today. The measures Rubin used to stay under the debt limit for more than four months would now last "a few days to a few weeks," according to GAO auditors. The Treasury also has on occasion curbed borrowing to stay under the debt limit, postponing scheduled auctions of government bonds and trimming the total value sold. The GAO found that "general uncertainty" forced the Treasury to pay millions of dollars in higher interest rates in the months leading up to debt-limit increases in the early 2000s and again last year. As Geithner readies his cash-management tools, some Republicans are pressing him to prepare for a lengthy battle that could force Treasury for the first time since the debt limit was established in 1917 to stop borrowing and make do with tax revenue. The government is forecast to collect $2.2 trillion in taxes this year and obligated to spend $3.7 trillion. That means Geithner could cover about 60 percent of the bills. Last month, all 47 Senate Republicans voted for a measure sponsored by Sen. Patrick J. Toomey (R-Pa.) that would require Geithner to pay interest on the debt first. At $225 billion this year, the payments would be easily affordable, said Toomey, a former bond trader who headed the anti-tax Club for Growth until his election last year. While it would be "traumatic" to slash other obligations, Toomey said, keeping interest payments current would avoid default and preserve the nation's sterling credit rating. "The administration has been exaggerating the consequences of all this," Toomey said in an interview. "If we didn't raise the debt limit when we reached it, we'd have the equivalent of a partial government shutdown, and the market knows very well that furloughing workers and suspending purchases of materials are not the same thing as defaulting on our bonds." During a 1985 debt-limit fight, the GAO concluded that the Treasury secretary "does have the authority to choose the order in which to pay obligations of the United States." But Treasury officials, who declined to comment on the record for this story, have discouraged talk about prioritizing the nation's expenses. In addition to being politically risky, the task presents huge logistical challenges. The Treasury makes hundreds of thousands of payments each day, most processed automatically by the Federal Reserve. Interrupting payments to manage daily cash flow would be far more complex than simply cutting off, say, payments to education programs. More to the point, Treasury officials say, prioritizing payments would not avoid default. In a January blog post, Deputy Treasury Secretary Neal S. Wolin argued that failing to meet any obligation -- whether interest payments or Medicare bills -- would trigger a loss of market confidence. "Adopting a policy that payments to investors should take precedence over other U.S. legal obligations would merely be default by another name," Wolin wrote. What are the consequences of default? There's disagreement about that, too. Last week, in a paper titled "The Case for Default," a Bank of America-Merrill Lynch analyst argued that hitting the debt limit might actually be a good thing, especially if the suspension of borrowing were brief and the political battle produced a plan to balance the nation's books. But most analysts take a darker view. Bill Gross, who runs Pimco, the world's biggest bond fund, said in an e-mail that failure to raise the debt ceiling would be "catastrophic -- global investors would move money at the margin to countries which have their act together, interest rates might rise by 50 basis points overnight, the stock market would plunge." Already, some traders have begun hoarding Treasury bills and other short-term assets in case the government stops issuing new debt. For now, such "disruptions" are minor but noticeable, said Karen Shaw Petrou, managing partner of the research firm Federal Financial Analytics. "It's like before a thunderstorm," she said. "The birds are quiet in the trees, and there's a very weird mood in the market. But it hasn't yet started to rain."